With recent market reports to be believed, the global e-Sports market revenue is anticipated to reach $2,174.8 million by the year 2023, with their being a growth at a CAGR of 18.61% during forecast period. For the unbeknownst, with the escalating prominence of video games & e-Sports, the number of e-Sports events across the world has also increased. You can see the live streaming of gaming tournaments on portals such as YouTube, while Twitch.tv is trending as well. So as the prominence and live streaming of e-Sports is growing, demand for e-Sports fantasy leagues will also rise. It is due to the fact that here fans are allowed to create their own fantasy sports league teams based on the live matches. This way, the rising popularity of e-Sports has in a way triggered the growth of the fantasy sports app development market. Well, not everyone has the exact idea of what are fantasy sports games. So, for the ones that don’t know, Fantasy Sports is a game where the participants create their own virtual/imaginary teams with the use of real players from different teams scheduled to play in a match or a league. The win or loss depends on the real performance of players in their created fantasy team. Meanwhile, the increased usage of smartphones and high internet penetration, mainly in APAC is certain to drive market during the forecast period that is present in this report “Global Fantasy Sports Market 2018-2022” by ResearchAndMarkets.com. Same as mentioned above, as per this report, the global market revenue is anticipated to be reaching $2,174.8 million by the year 2023, by its growth at a CAGR of 18.61% during forecast period. 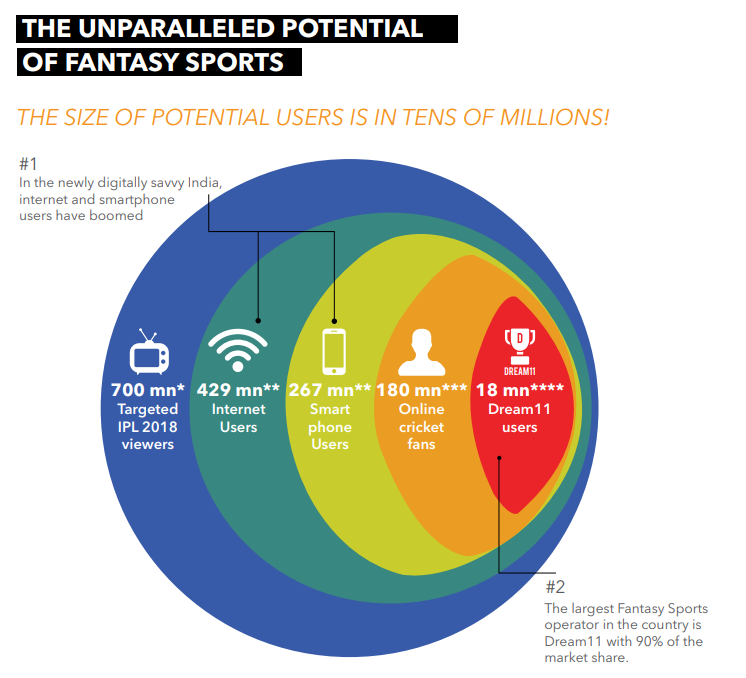 When the High Internet Penetration is combined with rising usage of affordable smartphones, the number of players who participate in fantasy sports surged exponentially. This rise in sports gaming enable the fans to engage a lot more with fantasy sports, like Fantasy football, Fantasy Cricket, Fantasy basketball, Fantasy baseball, etc. 53% of the players are primarily using their mobile devices for fantasy sports. 54% of fantasy sports users are aged between 18 & 34. Prominent Fantasy Sports are Basketball, NCAA Football, Baseball & Soccer. One needs to take a step back in time in order to understand the emergence of Fantasy Sports League. So it was in the year 1952 in the USA when Fantasy Sports first came into existence. Since then it has grown so much so that today it is enjoying 200+ operators with 59.3 million users (which is 21% of US population). In fact, around 65% of sports fans in the USA are playing fantasy sports. In the nation of India, the penchant for Fantasy Sports is here to stay and will grow only big in the coming times. In many ways, the industry is very much capable of breaking all the records when it coming to engaging the sports fans and testing their skills and knowledge of their much-loved sports. In fact, be prepared if in coming times we see all of the sports league in India offer their own Fantasy league to the sports aficionados, for instance, you must already have heard of Indian Premier League (IPL) & Indian Super League (ISL) running their own official fantasy leagues in India. 89% of the users are playing fantasy sports at least once a month. With 2 million users in the year 2016 to 20 million users in the year 2018, rapid growth has been registered in the last two years. The gap between 67% awareness & 10% adoption signal towards massive growth potential for the industry. Dream11 has around 1.8 crore users and this way the platform enjoys being the biggest player in this race of Fantasy sports players. As per IFSG-AC Nielsen report, 2 out of 3, which is 67% of 18 crore online Indian cricket enthusiasts know about Fantasy sports. Speaking of engaging, users today are spending 42 minutes a day playing fantasy sports applications. Besides, the usage of fantasy sports is proving to be pivotal for brand promotion as well. There are numerous big brands which use fantasy league in order to market their products. What these global brands do is that they use Fantasy sports for promotion, with the main aim to target high-income customers in age ranging from 25 to 50 years. This surge of advertisers is anticipated to continue overcoming a few years and promote market growth. What is Dream 11 and how it works? Think of ‘Fantasy Sports’ and tell us the one name that instantly clicks on your mind. Dream11 it is, isn’t it? In this world full of sports enthusiasts, what fuels them further is the mention of fantasy sports. These sports freaks just love the idea of participation in their favorite sports, be it in the manner of virtual means. And Dream11 has proven to be a milestone in this regard and has led up to numerous big names coming up in the arena of fantasy sports. Meanwhile, coming back to Dream11, well it is India’s one of the fastest growth Fantasy Sports League platform offered to both iOS and Android users via its mobile apps and website. It witnesses a rapid growth base of 20 million+ users. 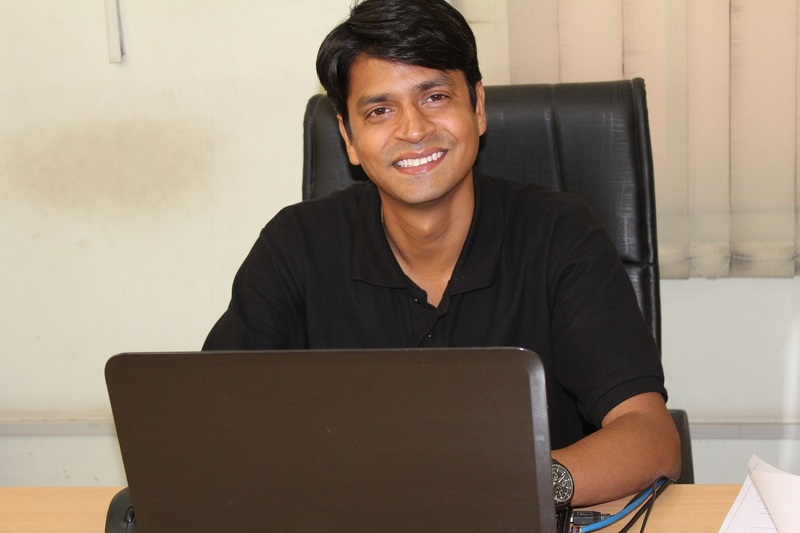 The ever-trending platform was founded by one crazy fantasy sports fan Harsh Jain with his co-founder in the year 2011, and they started working on the platform since then and upon its launch during the Indian Premier League season in 2018, they launched it with the name ‘Dream11’, through various online and offline media channels having Indian cricket Mahendra Singh Dhoni as its brand ambassador. Today Dream11 is among the most prominent and successful platforms with a rapid growth base of 20 million+ users. What are the Types of Contest one can play in Dream11? Here, two players create a contest investing an amount of Rs.100-100 each. Upon winning the prize money, a certain part of the winning amount goes to Dream11. Here, around three to five players create a contest and participate in it. And upon winning the prize money, a certain share of the amount goes to Dream11. Here, the contest is created by Dream11 app itself, where hundreds, to millions of players, participate and the winners are also a number of people. So here as well, a certain share of the winning prize from each winner’s amount goes to Dream11. Now comes to the business model of Dream11. So how does the app functions? Well, in the case of Fantasy sports business models, here they are specially designed & evolved around the real sports, real players and their real fans. This way, sports enthusiasts have the chance to take active participation in real sports games with fantasy sports. Same is the case with Dream11, which again works on the very same idea. Firstly, it allows users to signup for free. Users can simply enter the referral coupon code, they received from the other users during the signup process and thus, they can earn a certain amount of signup bonus. Also, the referral also gets paid a specific bonus amount for referring to the app. For each match, the user gets a chance to make her/his own fantasy team of 11 players (this is why it is named Dream11) as they like from the contestant teams with specific game rules of how many players they can select from each team & type (batsman, bowler, all-rounder). The user is assigned a specific budget (say 100 credits) as s/he created a new fantasy team and here s/he can spend that budget by including the player of their choice. Each of the players costs certain credit, and this is where the user will have to stay within a certain budget by picking the best players in a team. Once the dream team has been finalized by the user by choosing a captain & a vice-captain, it is now time that they join the available contest by paying a specific entry fee and this is from where Dream11 is earning most of the revenue. For each contest, there is a specific winning amount & also a limitation about how many teams can participate. At the same time, to prepare a dream team, users get a specific deadline prior to which each interested user should prepare as well as edit a team and join at least one contest so to become a part of it. On the basis of contest and number of teams who joined the platform then decides on the total of how many teams are going to be the winning and what winning amount would be distributed as per their rankings. Prior to a real sports event kicks in, the Dream11 platform announces the lock-in period. There cannot be any no new team enrollments & changes in the team during the lock-in period, as it is not allowed. And as the real game starts, the thrill begins. Why IT is the right time to invest in Fantasy Sports Business? There are countless opinions that vouch why it is the best time to invest in a Fantasy Sports business. First of all, the platform is hugely popular, and also with increased usage of smartphones and high internet penetration, more and more people are participating in it. Also, with so many people enjoying taking part in Fantasy sports, it is the time when businesses can utilize the platform to market their product and services. Moreover, the fantasy sports market is going to be cut through competitive in future, so it is the right time to launch a fantasy sports business to ensure lion share in the growing fantasy sports industry. And then, comes the most integral and most obvious reason: 2019-2020 is filled with Cricket events. Be it One-day-International (ODI) World Cup, T-20 World Cup, IPL seasons in 2019 & 2020, and numerous other cricketing events to be organized during this period, makes it most amazing for anyone to enter in Fantasy Sports business. 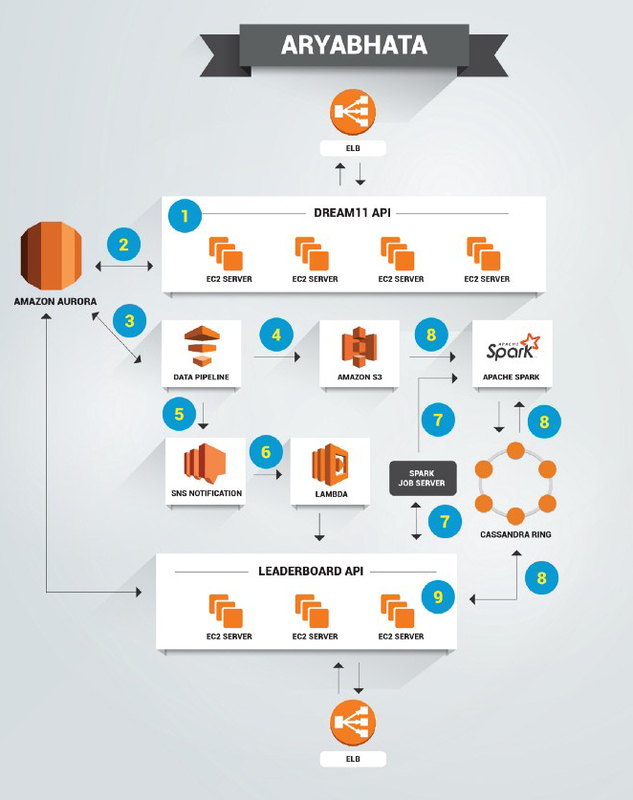 What are the features and functionalities of a successful Fantasy Sports Mobile app? As soon as the app is opened by the user, s/he would first land onto this screen after logging in. Here they can find entire match listings, and the search can be filtered by Matches, Sports Type (Football, NBA, Cricket), Match Category (Live/Ongoing match, Upcoming match, results.) Match listings may comprise of the Name of the tournament, Match Timing (Date & Time), Team 1 (Name with Image), & Team 2 (Name with Image). At this section, the users can browse all of the sports that are there offered by the platform. From here, the user can maintain his/her profile in the Fantasy Sports platform. With just a single tap, a user can create their own contest simply by the submission of following details, like Total Winning Amount (Max & Min. ), Contest Name, Contest Size (Min 2 & Max 100), Entry fee )which is calculated based on total price amount & selected contest size). Allow multiple team yes or no. Here first the contest creator is required to join the contest, prior to creating. Here users can invite their friends to join the contest by sharing app UR with them. As their friends use this referral code while joining, the user would receive a bonus amount. This section shows the winning history of the user, like the number of wins they have had in the past. This is the virtual wallet of the user from which the winning amount can be withdrawn as well as the money can be transferred to as well while participating in the game. This section gives statistics of the field, like Total Matches (Both Played as well as Ongoing), Total Contestants & Entire earning. From here, admin can manage the entire user account, such as Edit/Delete/Activate/Deactivate/Add Accounts. From here, admin can manage entire match contests, such as Edit/Delete/Add/Activate/Deactivate contests. From here, admin can view entire earnings from the app with different filters. From here, admin can manage the reward points earned by the user. From here, admin can view entire request from contestant to withdraw the winning amount into their preferred bank. Here the Admin is authorized to Accept or Reject Bank Details, Accept or Reject Pan card Details, View Entire Contestant List (both approved & rejected), Send the money to the contestant. Admin can manage the cash prize and bonus offered to participants. From here, Admin can manage sections, such as Contact Us, About Us, Points System, Help, and many other sections. Live Match Score: From here, the user can watch the live scores from various matches & sports, as well as expert analysis, game highlights, & original video programs. 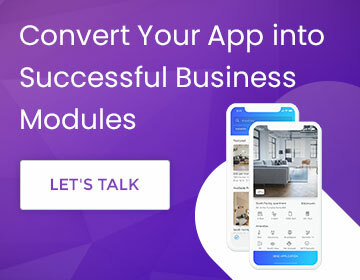 CRM integration: Here the app is integrated with back-end service provider & it is helpful in managing tickets, send emails, user location, push notifications & it proves a lot useful in several other ways as well. CMS Integration: Standing for Content Management System, from here, the user can manage the entire content of the app content. Players Record: This section shows the record of each player so that the user can see the records of each of the player and decide for the selection of players accordingly. Push Notifications: Using this feature, the messages and alerts can be sent to users for informing about when to create a team, when a match would begin, etc. Real-time Analytics: This technology proves helpful especially in case of apps which require the app to be captured in the real-time. The data is stored constantly as well as updated in the real-time. GPS Location Tracking: This feature is useful to send out the alerts & push-notifications to the users regarding upcoming/ongoing leagues & matches nearby their location. Custom Mail Reminder System: Custom emails are sent to participants so to inform them regarding the upcoming matches, as well as information in regard to the selected players/team. Multiple Payment System: There are several payment modes for this kind of app, ranging from e-Wallet, Netbanking, or Debit/Credit Cards. Loyalty Programs: This is quite useful to keep the user glued to the app, in the form of referral points and others. What makes web application important? Well, many times, a certain group of users doesn’t like to install the mobile app, due to several reasons that it slows their phone, or they may have less storage capacity, or several other obvious reasons. So, in that case, a fantasy sport web application can prove to be great, as then as many users can take part in the platform without the need to install the app on their mobile phone, as the web apps work on the browser. What Team Structure is required for Your Fantasy App Development? For developing a superior quality mobile applications, you will need the proficient fantasy sports app development company that is comprised of the skilled pool of subject experts, developers, designers and testers; thus, it becomes significant that you select the dexterous app development partner that is imbibed with true potential for developing your app. 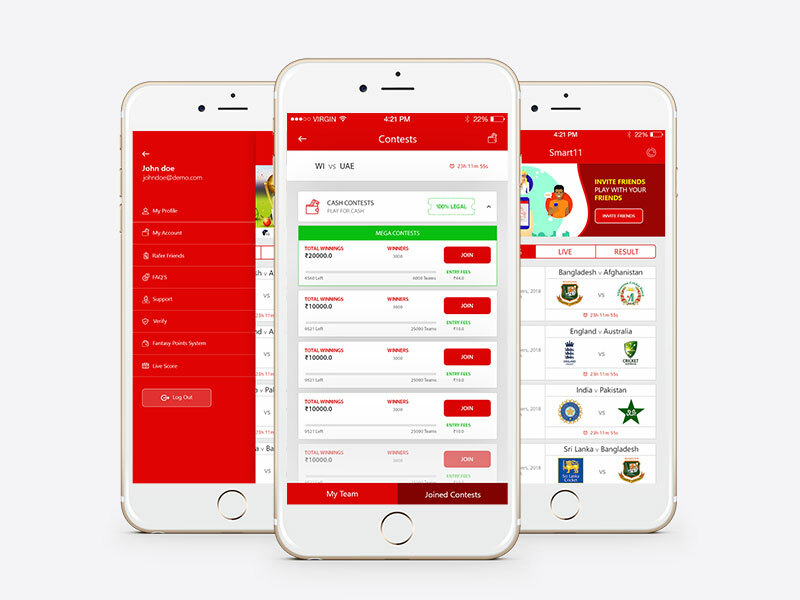 The case with the Dream11 is that it is a freemium fantasy cricket game, which means that here the users can join any contest for free or by paying a given entry fee. Now only to its business model, in the beginning, you won’t see the first single coin of net profit unless a few million users have joined the platform. Also like millions of users are participating in Dream11 every day, it is tough predicting the exact revenue that is earned by Dream11 each day. However, on the basis of the given contest, entry free, a number of teams and winning amount for each contest, the lump-sum revenue can be calculated. Each day, Dream11 tends to launch 15-17 high-valued contests, while 20-30 low-valued contest with total winning sum ranging from INR 3 Crore (US$450000) to something as minimum as INR 5000 (US$75). Meanwhile, the other 100s of the head-to-head & private contests aren’t considered here in this list. Getting together all of these above calculations, it is expected that Dream11 earns revenue of INR 4-6 crores (US$600,000-$900,000) from each of the matches. This may vary as per the popularity & fan-base of the playing teams & nations. Not just Dream11, but this business and revenue model could be applied to other fantasy sports businesses existing around the world with their own variations & game rules. How much does it Cost to Develop an App like Dream11? You have the opportunity to turn a successful entrepreneur by making some investments in the fantasy sports business by teaming up with the top fantasy sports mobile app development agency that has rich experience at creating fantasy sports mobile app. These companies are proficient at creating mobile apps for both iOS as well as Android platforms, and the total cost to develop such an app for both the platforms with the backend is certain to be somewhere between USD $19000-$24000. Talking specifically of India, let us tell you that participating in Fantasy Sports is absolutely legal in India, as Indian legal system clearly separated fantasy sports from gambling or betting activities, and describes it as a game of skill, where sports enthusiasts come together to create their respective team by combining the players, who they think would perform better than the rest in real-field game. By this, it is clear that Fantasy sports are a game of skill and it is excluded from the Gambling Act of 1867, thus safe to play.